From health to matchups to dumb luck, the stars have to align just right for a team to enjoy a successful year. That’s why Stanley Cup finalists often experience a hangover too. 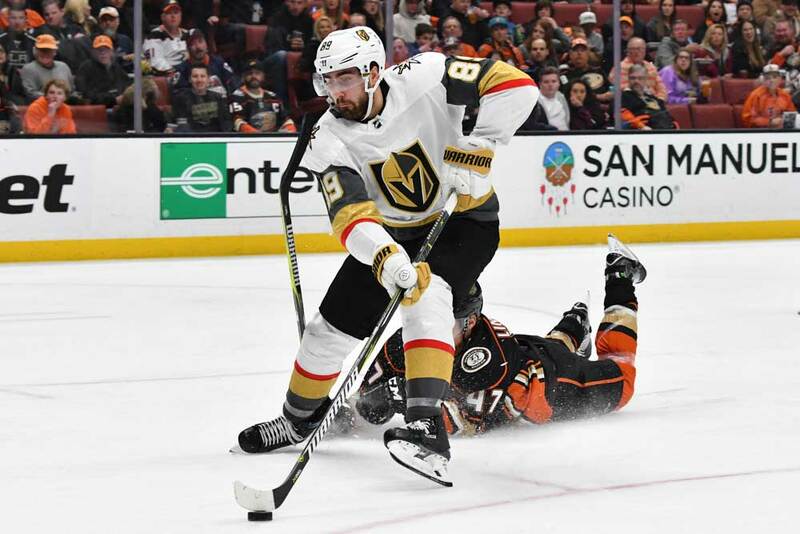 As last season’s Cinderella squad, the Vegas Golden Knights didn’t buck the trend early in 2018-19, struggling to a 5-6-1 record in October. While Gerard Gallant’s men weren’t playing bad hockey, last season’s magic had seemingly vanished. Vegas has controlled 55.5% of the scoring chances (1st) but only 50.5% of the goals scored (14th) at 5-on-5. Wins and losses are separated by the thinnest of margins, and the Golden Knights were missing that cutting edge from 2017-18. Well, the team has certainly snapped out of its funk. It’s rattled off an 8-1-1 streak in its last 10 games and holds third place in the Pacific Division. There are a few reasons for this turnaround, but one of the biggest is the return of Nate Schmidt from suspension. Alongside Brayden McNabb on the top pairing, the 27-year-old blueliner combines poise and blazing speed to keep danger to a minimum in the defensive zone. He may not be a great possession player (51.0 CF%), but his ability to nip the opposition’s designs in the bud is reminiscent of a younger Duncan Keith. Simply put, he reaches the point of attack and gains proper positioning quicker than players expect — particularly in the neutral zone, where his gaps are airtight. It’s no accident that he boasts the highest GF% (57.7) among Golden Knights defensemen. In 410 even-strength minutes together, he and McNabb sport a 61.0 GF%. In 390 minutes without Schmidt, McNabb’s GF% plummets to 40.0. Schmidt obviously makes all the difference on the back end, and his presence has helped the club find its stride overall. Without him early on, Vegas limped out to a 9-11-1 record. With him, the team is a remarkable 19-5-3. Up front, they have a slightly different identity this season due to the arrival of Paul Stastny (12 points in 18 games) and Max Pacioretty (24 points in 35 games). Both forwards have dealt with injury problems. Alex Tuch (37 points in 40 games) also missed the first eight games of the year. This prevented them from building instant chemistry on the second line, but it’s coming along nicely of late. Tuch has produced a phenomenal sophomore campaign, as he’s embraced the role of primary weapon and is wreaking havoc with his speed, size and solid offensive instincts. Meanwhile, Stastny has provided valuable minutes as a steady veteran down the middle. The 33-year-old isn’t an offensive dynamo, but his smarts and dependability have yielded a team-best 72.2 GF%. Granted, that 96.0 on-ice save percentage is unlikely to hold up. Even if you factor in a regression, though, Stastny has performed very well — certainly better than Cody Eakin or Erik Haula could. Pacioretty, for his part, is what he is: a streaky goal scorer. He will never take over games, but opponents can’t ignore him on account of his deadly release. Since a horrific October (2 points in 10 games), he’s amassed 22 points in 25 contests. As a trio, they’re difficult to handle. Tuch can overwhelm defenders with his pace and range, Pacioretty can make you pay for any slip-up and Stastny offers the quiet, fundamental approach that lets his wingers commit to generating offense and applying pressure on the opposition. The most surprising contributor has been Brandon Pirri (11 points in 10 games). Unable to stick on four previous franchises, the 27-year-old has done nothing but score as a Golden Knight. Since the start of 2017-18, he’s found the back of the net 10 times in 12 games. He’s a willing shooter above all else, and why not when you convert on 21.2% of your looks? At some point, you can’t overlook production. There’s no telling if he’ll remain with the big club long-term, but he’s at least earned an extended look. That type of depth is crucial. It’s especially important at the moment, as the top line of William Karlsson (30 points in 48 games), Jonathan Marchessault (31 points in 48 games) and Reilly Smith (27 points in 45 games) has taken a step back in 2018-19. For most of last season, Vegas was viewed as a group of cast-offs. This season, opponents are ready. They’re game-planning to stop this unit now and have thus been more successful in that respect. The line still controls play (54.6 CF%, 56.9 SCF%), but it’s claimed just 44.7% of the goals scored during its shifts compared to 67.1% last season. To be fair, that syncs up with a dramatic PDO slide from 104.2 to 97.2. In reality, Karlsson, Marchessault and Smith belong somewhere in the middle. They’re not as ridiculously good as they were in 2017-18, but they’re better than they’ve been through the first half of 2018-19. Once Smith is taken off injured reserve and their puck luck normalizes, Vegas’ offense will be even more potent than last year’s — especially if Pirri sticks around in a third-line capacity. Tuch has developed into an absolute beast, whereas Stastny and Pacioretty represent a net improvement over David Perron (St. Louis Blues) and James Neal (Calgary Flames). This has the makings of a lethal, well-rounded attack. That’s the beauty of these Golden Knights: The story doesn’t revolve around a scintillating first line and a Vezina-caliber year from Marc-Andre Fleury. The 34-year-old netminder’s numbers are actually a bit worse this season (2.49 GAA, 91.1 SV% vs. 2.24 GAA, 92.7 SV%), but his team is deeper. It can pick up the slack if he falters to some degree. That leeway didn’t exist in 2017-18, and it finally caught up to the club in the finals. Since this isn’t Vegas’ inaugural campaign and the team isn’t at the very top of the standings, there isn’t as much hype surrounding the 2018-19 Golden Knights. There isn’t an easy narrative to cling to. Their recent hot streak has them riding high nonetheless, and because roster upgrades have raised their ceiling, they have their sights set even higher. Maybe the fairy tale isn’t over quite yet.